Oscillations are fundamental network properties and are modulated by disease and drugs. Studying brain-slice oscillations allows characterization of isolated networks under controlled conditions. Protocols are provided for the preparation of acute brain slices for evoking CA1 γ oscillations. Hatch, R. J., Reid, C. A., Petrou, S. Generation of Local CA1 γ Oscillations by Tetanic Stimulation. J. Vis. Exp. (102), e52877, doi:10.3791/52877 (2015). Neuronal network oscillations are important features of brain activity in health and disease and can be modulated by a range of clinically used drugs. A protocol is provided to generate a model for studying CA1 γ oscillations (20 - 80 Hz). These γ oscillations are stable for at least 30 min and depend upon excitatory and inhibitory synaptic activity in addition to activation of pacemaker currents. Tetanically stimulated oscillations have a number of reproducible and easily quantifiable characteristics including spike count, oscillation duration, latency and frequency that report upon the network state. The advantages of the electrically stimulated oscillations include stability, reproducibility and episodic acquisition enabling robust characterization of network function. This model of CA1 γ oscillations can be used to study cellular mechanisms and to systematically investigate how neuronal network activity is altered in disease and by drugs. Disease state pharmacology can be readily incorporated by the use of brain slices from genetically modified or interventional animal models to enable selection of drugs that specifically target disease mechanisms. Brain network oscillations occur within distinct frequency bands that correlate to behavioral states. In rodents, hippocampal θ oscillations (5 - 10 Hz) are observed during exploratory behaviors1,2, while γ oscillations (20 - 80 Hz) associate with various cognitive processes, including perception and attention3,4. Synchronous γ network activity is also implicated in the pathology of disorders such as epilepsy and schizophrenia5,6. For example, γ oscillations are thought to correspond to areas of cortical epileptic foci5,7,8 and could be used as markers of pharmacosensitivity or resistance, two important areas of investigation in epilepsy research9. The hippocampal brain slice is a model that has been widely used to investigate network activity10-12. Various protocols have been developed to generate γ oscillations in brain slices that typically involve pharmacological modulation such as low Mg2+, 4-aminopyridine (4AP), bicuculline, and kainic acid12-17. Shortcomings of pharmacologically triggered oscillations are that they occur randomly after drug application and are not reliably generated or stable over time. Electrically triggered γ oscillations overcome many of these problems and also have the advantage of being temporally locked to the stimulating event allowing for episodic recording and analysis. Here a protocol is described for generating CA1 γ oscillations by delivering a tetanic stimulation to the stratum oriens in the hippocampal slice. All experiments on mice were approved by the Florey Institute animal ethics committee. Prepare a cutting solution comprised of (mM) 125 Choline-Cl, 2.5 KCl, 0.4 CaCl2, 6 MgCl2, 1.25 NaH2PO4, 26 NaHCO3, 20 D-glucose saturated with carbogen gas (95% O2–5% CO2) and an artificial cerebrospinal fluid (aCSF) recording solution comprised of (mM) 125 NaCl, 2.5 KCl, 2 CaCl2, 2 MgCl2, 1.25 NaH2PO4, 26 NaHCO3, 10 D-glucose, saturated with carbogen. Place the cutting solution on ice to keep it cold. Freeze approximately 400 ml of the cutting solution and blend together with 100 ml of unfrozen cutting solution to create an ice slurry. Bubble with carbogen (95 % O2–5 % CO2) at a flow of approximately 0.5 L/min through small caliber tubing or sintered glass to produce a steady but gentle flow of bubbles. Prepare a 250 ml beaker with a raised nylon mesh insert on which the brain slices will be placed. Fill with aCSF to cover the mesh by approximately 2 cm and bubble with carbogen, ensuring that the bubbles do not directly disrupt the slice holding area. It is also important that there are no air bubbles in the nylon mesh, so if any are present remove them. This will be the holding chamber and is kept at RT (20 - 25 °C). Layout the dissecting instruments including a large pair of scissors, a small pair of scissors, small and large micro spatulas, and large and small pairs of forceps and chill them on ice. Place the vibratome tissue-cutting block on ice on a square of aluminum foil. Obtain 2 pieces of 6 cm filter paper, a single edge razor blade, and a 25 ml beaker filled with the cutting solution slurry as well. Fill a second container with ice, and lay a piece of tissue paper on the ice and place a 12 cm culture dish on top. Fill the culture dish with cutting solution ice slurry and bubble with carbogen. This is the container in which the brain dissection with be performed. Prepare the vibratome. Remove a fresh double edged razor blade (use a fresh blade every time) from its wrapping and spray with 80% ethanol then deionized water. Cut a 3 ml plastic transfer pipette at the point where it starts to taper. This will be used to transfer brain slices. Bend a 27 G needle at the base by approximately 45° and attach to a 1 ml syringe. This will be used to manipulate slices during cutting. Anesthetize a mouse (P16 - P18) with 2% isoflurane or a locally approved method. Following induction, decapitate the animal with a large pair of scissors and drop the head into the 12 cm culture dish that contains bubbled cutting solution slurry. The slurry must totally immerse the head for rapid cooling. Hold the front of the head with one hand peeling the skin and connective tissue forward towards the nose. Using the small scissors cut the connective tissue to reveal the underlying skull. Then remove the muscles overlying dorsal aspect of the skull and neck. Remove the brain from the skull by first securing the front of the skull with the large forceps and then make two lateral cuts through the bone either side of the foramen magnum using the small scissors (Figure 1, cuts labeled A1 and A2). 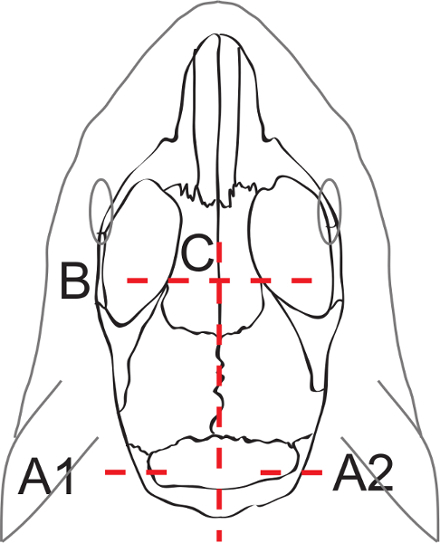 Make another cut between the eyes (just anterior of the bregma) (Figure 1, cut labeled B) then carefully cut along the sagittal suture anteriorly and reflect the cut skull sections to reveal the brain (Figure 1, cut labeled C). Use the small spatula to scoop out the brain and place onto a culture dish. Be aware of the cranial nerves on the inferior aspect of the brain which will need to be severed, this can be done using the smaller sized micro spatula. Using the larger spatula transfer the brain to the 25 ml beaker filled with the cutting solution slurry. Preparing the brain hemisphere for slicing. Place one piece of the 6 cm filter paper in the bottom of a fresh culture dish then fill with fresh cutting solution slurry and bubble. Use the larger spatula to position the brain, ventral side down, onto the filter paper. Take a new and cleaned single edge razor blade and cut the brain to remove the cerebellum, then make a cut along the mid line to separate the brain into two hemispheres. Preparing the vibratome tissue block. Take the chilled vibratome tissue block, dry the surface, and place a drop of cyanoacrylate glue in the middle and spread evenly to the approximate size of the brain. Use the small spatula to manipulate one of the brain hemispheres onto the large micro spatula so the medial side of the brain is down. Touch the edge of the spatula at the interface of the brain on the second piece of filter paper to remove as much of the solution as possible. Slide the brain off the larger spatula using the smaller spatula to guide it onto the glue. Secure the cutting block into the vibratome chamber and fill the chamber with cutting solution slurry and bubble, ensuring the brain is completely immersed. Rotate the cutting block so the ventral side of the brain is facing the blade. Note: Each vibratome is unique so follow the manufacturer’s instructions. Set the slice thickness to 450 µm, and ensure the blade is vibrating as it moves through the brain at a speed of approximately 0.3 mm/s. Cut entirely through the brain from the ventral side to the cortical surface, this will produce whole brain sagittal slices that can be used for electrophysiological recordings. Slices will be produced laterally to medially and typically 3 - 4 slices can be cut from each hemisphere. If the base of the slice lifts use the bent 27 G needle to gentle press the slice back down. As each slice is cut, use the transfer pipette to move it onto the platform in the holding chamber where they are viable for up to 8 hrs. Mounting the slice in the recording chamber. Using the transfer pipette, place a brain slice into a submerged recording chamber perfused with aCSF flowing at 1 - 2 ml/min and heated to 32 °C. The aCSF used for recordings differs from that in the holding chamber as the Mg2+ concentration is increased from 2 mM to 4 mM. Secure the slice with a “harp” (semi circular stainless steel with nylon strands stretched across at 2 - 3 mm spacing). Place the harp so that the strands run parallel to CA1. Increase the speed of the perfusion to 8 - 10 ml/min at 32 °C. Under a dissecting microscope place a stimulating electrode and a recording electrode (glass electrode filled with the aCSF recording solution) on the surface of the stratum radiatum of the CA1 (Figure 2A). Place the stimulating electrode first then place the recording electrode. Stimulate the Schaffer collaterals with a 120 - 150 µA amplitude and 0.1 msec duration test pulse and observe the resulting field excitatory post synaptic potential (fEPSP) waveform to determine slice health (Figure 2B). The stimulating and recording electrodes may need to be moved into the slice approximately 50 - 100 µm from the slice surface to get a fEPSP recording with a small fiber volley and large amplitude. The Schaffer collateral evoked fEPSPs are stereotypical and provide a good indicator of slice health. Healthy slices typically show a fiber volley to fEPSP amplitude ratio of less than 0.3. Using a dissecting microscope, move the stimulating electrode to the middle of the stratum oriens and move the recording electrode to the pyramidal cell layer as close to the recording electrode as possible as shown in Figure 3A. The stimulating and recording electrodes may need to be pushed into the slice approximately 50 - 100 µm so that the fEPSP response amplitude to the 120 - 150 µA test pulse is approximately 1 mV. To generate γ oscillations stimulate the tissue with a train of 20 x 0.1 msec pulses delivered at 200 Hz. This tetanic stimulus can yield reproducible responses when delivered every 5 min. Use the following recording parameters. Scale the gain of the output signal to match the input voltage range of the analog to digital converter. Make sure that maximum expected signal excursion uses a minimum of 30% of the input voltage range. Be careful when setting gains to high as signals might clip. The typical bandwidth needed for field recordings is 500 Hz with AC coupling at 0.1 Hz to remove baseline drift. Digitize at least 4 - 5 times faster than the corner frequency of the low pass filter to avoid signal aliasing. Calculate the number of spikes as the total number of spikes per oscillation for each sweep is determined. Calculate the oscillation latency. For each oscillation, subtract the time of the first identified spike from the end of the stimulation artifact. Calculate the average inter-event interval (ISI). Determine the time period between multiple detected spikes and average. Calculate the oscillation duration. 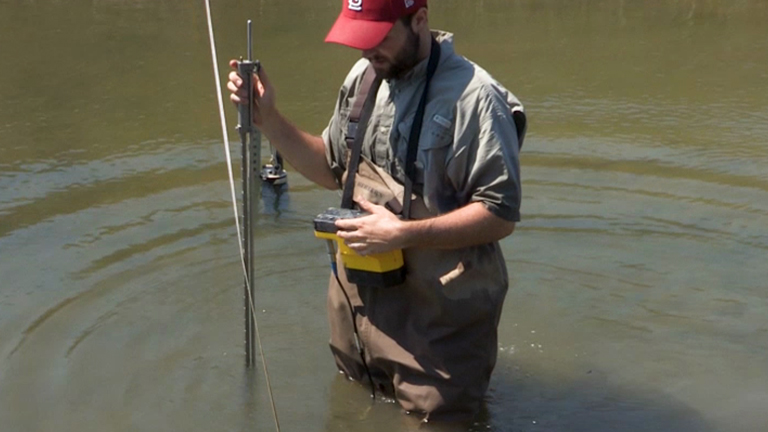 Measure the time between the first and last detected spike within each oscillation. Tetanic stimulation of the stratum oriens generated robust and reproducible γ oscillations (35.4 ± 2.2 Hz), see Figure 3B. To demonstrate that the oscillations were generated within the local CA1 network the inputs from CA3 were severed by cutting the slice in the CA2 region using a bent 32 G needle. The oscillation properties in the cut slices did not differ from the uncut slices (p = 0.85; cut slices 6.16 ± 1.1 spikes, n = 6; uncut slices 5.89 ± 0.8 spikes, n = 6), indicating that the oscillations are generated locally. An important advantage of this method is the stability of recordings. When the tetanus was delivered at 5-min intervals the oscillations were stable for at least 30 min for any given slice (p = 0.26 for number of spikes at 15 min vs. 30 min). There is variability between slices in the total number of spikes within an oscillation and other parameters. For drug studies paired experiments can be done so that differences in baseline properties are minor factors. For intra-slice comparisons variability can be a concern and can be overcome by sufficiently powering comparisons. Next, the ion channels and receptors that are required for the generation of these tetanically stimulated CA1 γ oscillations were investigated. Pharmacological blockade of α-amino-3-hydroxy-5-methyl-4-isoxazolepropionic acid (AMPA) receptors with 20 µM 6-cyano-7-nitroquinoxaline-2,3-dione (CNQX) (Figure 4A, B), GABAA receptors with 20 µM bicuculline (Figure 4C), Ih current with 20 µM 4-(N-ethyl-N-phenylamino)-1,2-dimethyl-6-(methylamino) pyrimidinium chloride (ZD7288) (Figure 4D), and T-type Ca2+ channels with 100 µM Ni2+ (Figure 4E) were each independently able to reduce the number of spikes generated (p < 0.05; CNQX n = 6; bicuculline n = 7; ZD7288 n = 6; Ni2+ n = 6). Application of (2R)-amino-5-phosphonopentanoate (AP5, 20 µM) did not affect the number of spikes (p = 0.22; n = 5; AP5, 5.9 ± 3.1 spikes; control, 8.3 ± 2.2 spikes), suggesting that NMDA receptors are not involved in γ oscillation generation in this preparation. This preparation is ideal for determining the network scale action of drugs. Retigabine is a clinically used anti-epileptic medication that opens potassium channels and reduces membrane excitability18-20. Bath application of retigabine produced a dose-dependent reduction in the number of spikes in and duration of the oscillation (Figure 5). Figure 1. Schematic of the skull and overlying skin showing location of cuts to reveal the brain. 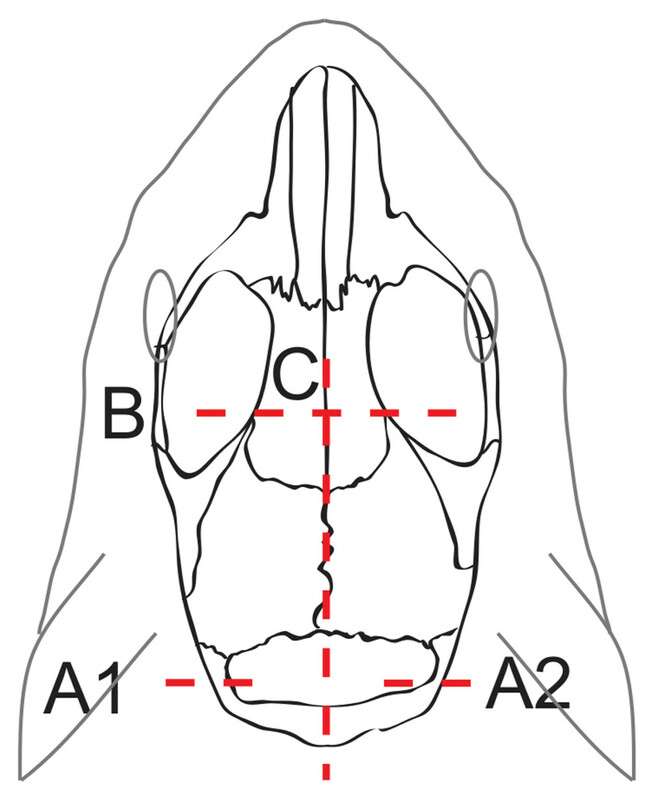 A1, A2, B and C mark the locations of cuts that need to be made to open up the skull for the removal of the brain. Please click here to view a larger version of this figure. Figure 2. Placement of the stimulating and recording electrodes in the CA1 Schaffer collaterals to test slice health. (A) Shows placement of the stimulating electrode (Stim) and the recording electrode (Rec). (B) A representative example of a fEPSP evoked by a 120 µA stimulation (fiber volley marked by *). Please click here to view a larger version of this figure. Figure 3. Configuration of recording and stimulation electrodes used to evoke oscillation. (A) Location of the stimulating electrode (Stim) in the stratum oriens and recording electrode (Rec) in the stratum pyramidale of the CA1. (B) A representative example of the γ oscillations induced by tetanic stimulation (artifact marked by “Stim”). Representative trace showing quantifiable outputs. ISI inter-spike interval. Please click here to view a larger version of this figure. Figure 4. Pharmacological characterization of tetanically generated γ oscillations. (A) Representative trace demonstrating the effect of CNQX. Graphs demonstrating the effect of (B) CNQX (20 µM; n = 6), (C) bicuculline (20 µM; n = 7), (D) ZD7288 (20 µM; n = 6) and (E) Ni2+ (100 µM; n = 6) on the number of spikes. Data are presented as paired comparisons. *p < 0.05, **p < 0.01 and, ***p < 0.001. Please click here to view a larger version of this figure. Figure 5. Retigabine effects on network properties. Representative examples showing the reduced network activity of induced oscillations (A) in control conditions and (B) and (C) with retigabine. Summary of the effects shown in (D) spike count, (E) oscillation duration, (F) latency to oscillation onset, and (G) inter-spike interval (ISI). Data are presented as paired comparisons. *p < 0.05. Please click here to view a larger version of this figure. A robust method to generate CA1 γ oscillations in acute brain slices is described. The oscillations generated arise from a local circuit enabling a better opportunity for controlling and understanding the neurophysiological basis of network oscillations12. AMPA receptors, GABAA receptors, Ih and T-type Ca2+ channels are all required for γ oscillations in this model. While the local CA1 oscillations described here can be robustly generated this is dependent on ensuring that the brain slices are healthy. A critical step is rapid removal of the brain from the skull, taking care to not penetrate the brain during removal and then rapid immersion in ice cold solution. Ideally the time between decapitation and removal of the brain from the skull should be no more than 30 - 60 sec to preserve slice health21. By using tetanic stimulation local CA1 γ oscillations can be generated in standard physiological recording solutions without reliance on pharmacological agents. This is advantageous for characterizing pathologies in disease models where addition of pharmacological agents may confound interpretation. For example, using this model local CA1 activity and sensitivity to anti-epileptic drugs was enhanced in a mouse model of human genetic epilepsy22. The use of this model to investigate network activity is not limited to epilepsy and may easily be applied to other diseases such as Alzheimer’s disease, autism and schizophrenia. While pharmacological agents are not required to generate the local CA1 oscillations sufficient tissue oxygenation is, due to the metabolic demand of the brain slice23. High perfusion rates improve oxygen and pH balance within the slice creating a more physiological environment for the brain slices24,25. A further advantage of using tetanic stimulation to generate network oscillations is that an episodic experimental design can be used that enables more ready quantitation of network activity parameters, such as delay to onset, duration and spike numbers, in a repeatable manner. In contrast, chemically induced network activity is spontaneous13,15,16,26-28 and more difficult to quantify. Tetanic stimulation, however, can cause changes in NMDA receptor-dependent synaptic plasticity, which can cause changes in network activity over time. To control for this and enable stable oscillation generation over multiple tetanic stimulations plasticity changes can be limited by elevating Mg2+ levels. Although this protocol enhances reproducibility it is opaque to any influence of NMDA receptor function. Interface recording chambers can improve slice health, yield better signal to noise ratios and more focal lower intensity stimulation with the added benefit of smaller stimulation artifacts. Perforated chamber recording methods would also improve slice health for long term experiments. Using micro electrode array recording chambers or patch clamp recording enables wide field and single neuron function to be measured during recordings to better investigate mechanisms underlying γ oscillations and their impact on broader network function. Incorporation of voltage and calcium sensors as well as optogenetic methods would introduce additional experimental flexibility in both recording and stimulating paradigms. Similar protocols developed for other brain regions that may be more relevant to the disease pathology under study. A final use for the protocol describe here may be for building and testing computation models of oscillations by combining field recordings with single neuron patch clamp and imaging studies. Supported by APA to RJH, NHMRC program grant 400121 to SP, and NMHRC fellowship 1005050 to SP. CAR acknowledges the support of the ARC (FT0990628) and the DOWD fellowship scheme. The Florey Institute of Neuroscience and Mental Health is supported by Victorian State Government infrastructure funds. Buzsaki, G. Theta rhythm of navigation: link between path integration and landmark navigation, episodic and semantic memory. Hippocampus. 15, (7), 827-840 (2005). Vanderwolf, C. H. Hippocampal electrical activity and voluntary movement in the rat. Electroencephalogr. Clin. Neurophysiol. 26, (4), 407-418 (1969). Bartos, M., Vida, I., Jonas, P. Synaptic mechanisms of synchronized gamma oscillations in inhibitory interneuron networks. Nat. Rev. Neurosci. 8, (1), 45-56 (2007). Buzsáki, G., Wang, X. -J. Mechanisms of gamma oscillations. Annu. Rev. Neurosci. 35, 203-225 (2012). Kobayashi, K., et al. Cortical contribution to scalp EEG gamma rhythms associated with epileptic spasms. Brain Dev. 35, (8), 762-770 (2013). Andreou, C., et al. Increased Resting-State Gamma-Band Connectivity in First-Episode Schizophrenia. Schizophr Bull. (2014). Alarcon, G., Binnie, C. D., Elwes, R. D., Polkey, C. E. Power spectrum and intracranial EEG patterns at seizure onset in partial epilepsy. Electroencephalogr. Clin. Neurophysiol. 94, (5), 326-337 (1995). Fisher, R. S., Webber, W. R., Lesser, R. P., Arroyo, S., Uematsu, S. High-frequency EEG activity at the start of seizures. J. Clin. Neurophysiol. 9, (3), 441-448 (1992). Kwan, P., Brodie, M. J. Early identification of refractory epilepsy. N. Engl. J. Med. 342, (5), 314-319 (2000). Traub, R. D., Kopell, N., Bibbig, A., Buhl, E. H., LeBeau, F. E., Whittington, M. A. Gap junctions between interneuron dendrites can enhance synchrony of gamma oscillations in distributed networks. J. Neurosci. 21, (23), 9478-9486 (2001). Traub, R. D., Whittington, M. A., Buhl, E. H., Jefferys, J. G., Faulkner, H. J. On the mechanism of the gamma --> beta frequency shift in neuronal oscillations induced in rat hippocampal slices by tetanic stimulation. J. Neurosci. 19, (3), 1088-1105 (1999). Whittington, M. A., Stanford, I. M., Colling, S. B., Jefferys, J. G., Traub, R. D. Spatiotemporal patterns of gamma frequency oscillations tetanically induced in the rat hippocampal slice. J. Physiol. 502, (3), 591-607 (1997). Avoli, M., Panuccio, G., Herrington, R., D’Antuono, M., de Guzman, P., Lévesque, M. Two different interictal spike patterns anticipate ictal activity in vitro. Neurobiol. Dis. 52, 168-176 (2013). Boido, D., Jesuthasan, N., de Curtis, M., Uva, L. Network Dynamics During the Progression of Seizure-Like Events in the Hippocampal-Parahippocampal Regions. Cereb Cortex. 24, (1), 162-173 (2014). Gloveli, T., Albrecht, D., Heinemann, U. Properties of low Mg2+ induced epileptiform activity in rat hippocampal and entorhinal cortex slices during adolescence. Brain Res. Dev. Brain Res. 87, (2), 145-152 (1995). 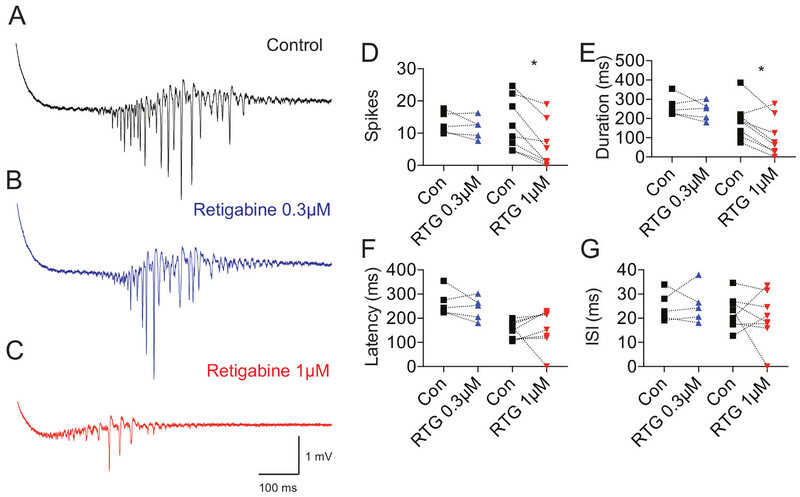 McLeod, F., Ganley, R., Williams, L., Selfridge, J., Bird, A., Cobb, S. R. Reduced seizure threshold and altered network oscillatory properties in a mouse model of Rett syndrome. Neuroscience. 231, 195-205 (2013). Bracci, E., Vreugdenhil, M., Hack, S. P., Jefferys, J. G. On the synchronizing mechanisms of tetanically induced hippocampal oscillations. J. Neurosci. 19, (18), 8104-8113 (1999). Main, M. J., Cryan, J. E., Dupere, J. R., Cox, B., Clare, J. J., Burbidge, S. A. Modulation of KCNQ2/3 potassium channels by the novel anticonvulsant retigabine. Mol. Pharmacol. 58, (2), 253-262 (2000). Wickenden, A. D., Yu, W., Zou, A., Jegla, T., Wagoner, P. K. Retigabine, a novel anti-convulsant, enhances activation of KCNQ2/Q3 potassium channels. Mol. Pharmacol. 58, (3), 591-600 (2000). 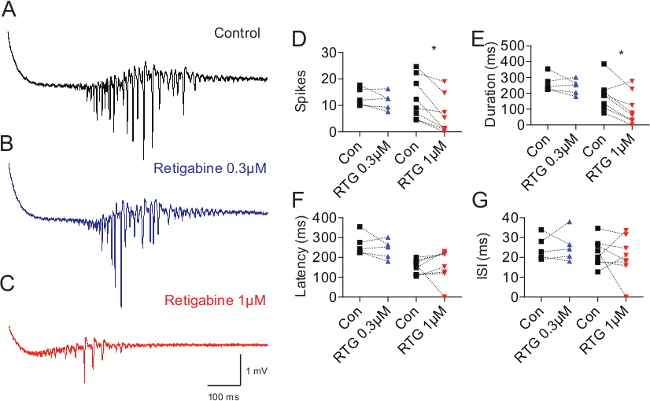 Otto, J. F., Kimball, M. M., Wilcox, K. S. Effects of the anticonvulsant retigabine on cultured cortical neurons: changes in electroresponsive properties and synaptic transmission. Mol. Pharmacol. 61, (4), 921-927 (2002). Pomper, J. K., Graulich, J., Kovacs, R., Hoffmann, U., Gabriel, S., Heinemann, U. High oxygen tension leads to acute cell death in organotypic hippocampal slice cultures. Brain Res. Dev. Brain Res. 126, (1), 109-116 (2001). Hatch, R. J., Reid, C. A., Petrou, S. Enhanced in vitro CA1 network activity in a sodium channel β1(C121W) subunit model of genetic epilepsy. Epilepsia. 55, (4), 601-608 (2014). Lord, L. -D., Expert, P., Huckins, J. F., Turkheimer, F. E. Cerebral energy metabolism and the brain/'s functional network architecture: an integrative review. J. Cereb. Blood Flow Metab. 33, (9), 1347-1354 (2013). Hájos, N., et al. Maintaining network activity in submerged hippocampal slices: importance of oxygen supply. Eur. J. Neurosci. 29, (2), 319-327 (2009). Hájos, N., Mody, I. Establishing a physiological environment for visualized in vitro brain slice recordings by increasing oxygen supply and modifying aCSF content. J. Neurosci. Methods. 183, (2), 107-113 (2009). Boido, D., Jesuthasan, N., de Curtis, M., Uva, L. Network Dynamics During the Progression of Seizure-Like Events in the Hippocampal-Parahippocampal Regions. Cereb Cortex. 24, (1), 163-173 (2012). Antuono, M., Köhling, R., Ricalzone, S., Gotman, J., Biagini, G., Avoli, M. Antiepileptic drugs abolish ictal but not interictal epileptiform discharges in vitro. Epilepsia. 51, (3), 423-431 (2010). Stenkamp, K., et al. Enhanced temporal stability of cholinergic hippocampal gamma oscillations following respiratory alkalosis in vitro. J. Neurophysiol. 85, (5), 2063-2069 (2001).